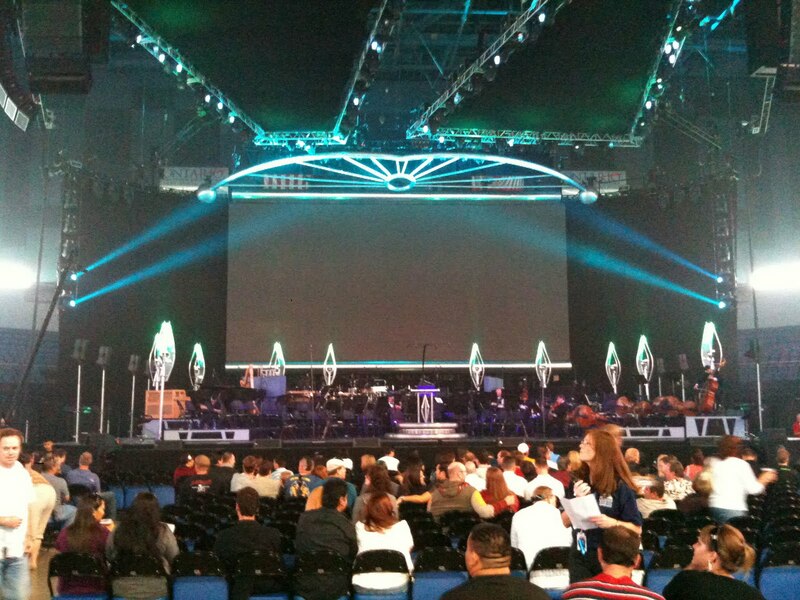 Last week on Sunday, I went to Star Wars In Concert at the Citizens Business Bank Arena in Ontario, CA. I got the tickets a week previous to that for my birthday, three tickets in total so it was my dad, mom, and I. The show started at 7 pm and doors opened at 6 pm, so we left the house at around 4:15 pm. We arrived at the arena a little bit after 5 pm and the crowd for the first show that started at 3 pm was about to be let out. The arena is very new so it has a great parking area with lots of room. We were able to get a space that was both near the front of the arena and near an exit for easy access when the show was over. At about 5:30 pm people began to line up and we joined them. The doors opened at approximately 5:50 pm and immediately after we entered the big merchandising stand was straight in front of us. I had checked out some of the shirts a couple of days before hand, so I knew what to expect. I double-checked their stock to see if they had anything exclusive that wasn’t available online. They didn’t, but I was able to see what the shirts looked like up close. I also got to see what their prices were. When ordering online, most of the shirts went for about $25, however, at the concert, most items were started at $35. There was more than shirts, including posters, hats, handbags, and souvenir programs. After I checked out the merchandise, we roamed thehalls of the arena. 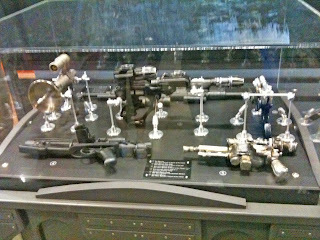 Along with the actual concert, a museum traveled along with it that included original movie props, costumes, concept art, and other authentic items. This was really great. 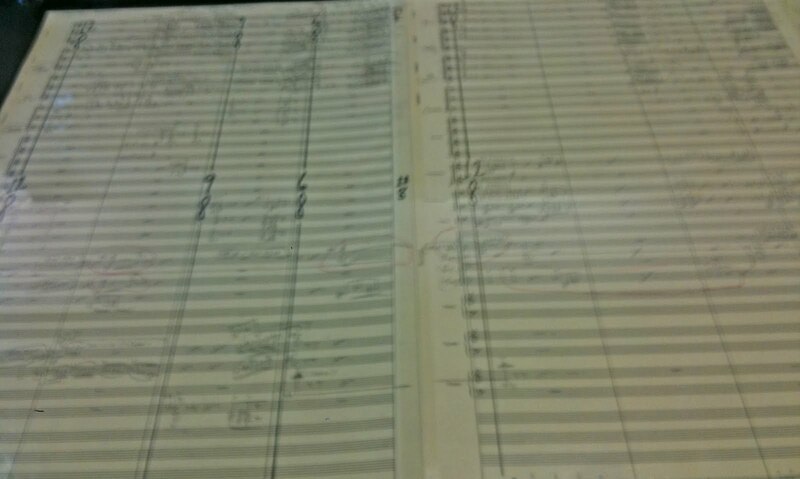 I got to see some of the original concept art for Revenge of the Seth, the blaster movie props for A New Hope, and the original score for Star Wars, handwritten by John Williams in pencil with almost every instrument in the orchestra listed. There were also lots of people dressed in Star Wars costumes. My best bet is that these were members of the 501st, a nation-wide community organization of people who dress as Star Wars characters. 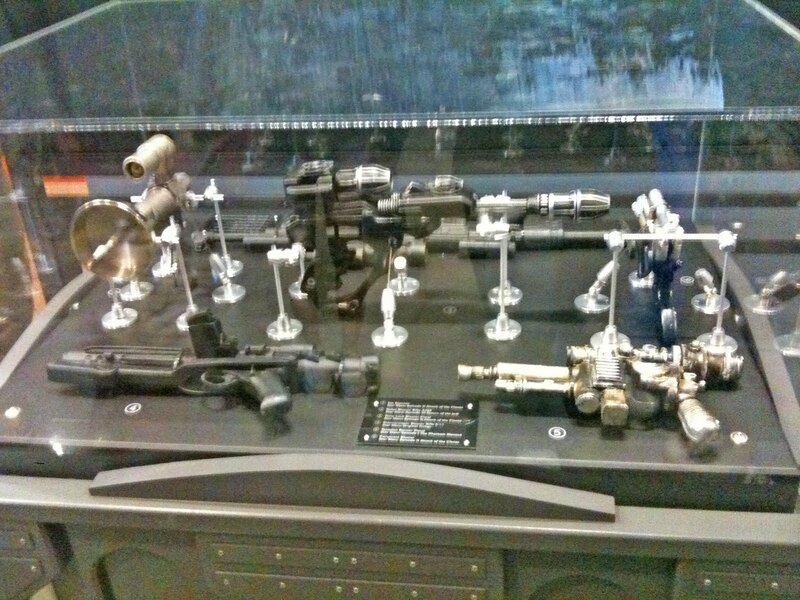 They have been part of charity events, official Lucasfilm events, and conventions. There were people dressed from your standard Stormtrooper, all the way to an Obi-Wan Kenobi with a Yoda puppet. 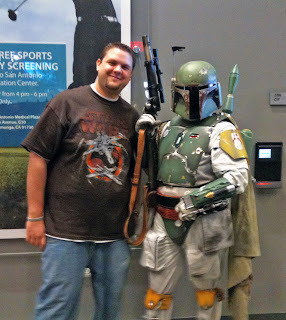 I was happy to get my picture taken with Boba Fett, who had a really good looking costume. We checked out the different displays they had through the rest of the arena halls and made our way to our seats at about 6:30 pm. We were seated in the upper section on the side. It was far back, but I was just glad to be inside the building, regardless where I sat. The unfortunate part was that because of the way the screen and speaker system was set up, there was a column of speakers blocking our view of the three-story LED screen. About five minutes after taking our seats, a man with the Citizens Business Bank Arena came to our section and explained that they realized that our view was being blocked by speakers and he would be trading our tickets for upgraded floor seats, free of charge. So instead of a seat on the side far back in the arena, we would be on the floor, close to the stage, and have an unblocked view of the screen. The concert itself was amazing. That’s really the best way I can describe it. The orchestra was great. They hit every nuance and sound, if you compared them with the digital recording of the music, I wouldn’t have been able to tell the difference. 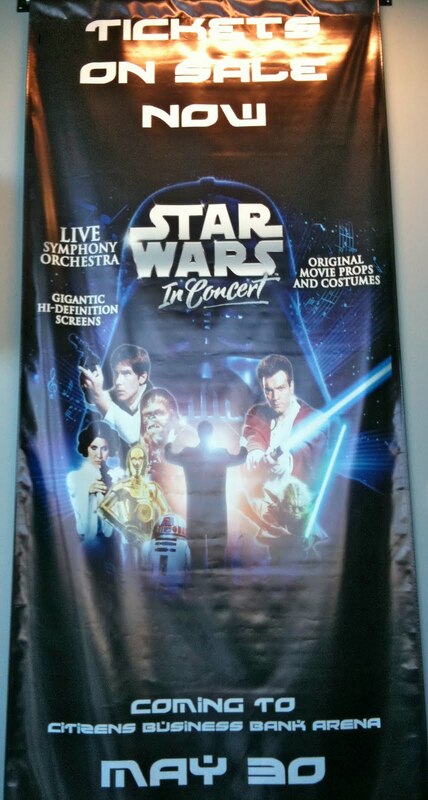 Narrated by Anthony Daniels, the actor who played C-3PO, the concert told the story of Star Wars from the first film to the last, highlighting key moments and events and accentuated each by a theme or suite of music that was accompanied by scenes familiar with that music. For example, here is a YouTube video of the Imperial March performance, showing the kinds of scenes that went along with the music. I am happy I was able to experience such a great concert. What makes me most excited is that more people are being exposed to classical orchestra music through other mediums than normal high culture events like the opera or theater. As I wrote this, I learned that PBS would be broadcasting a 90 minute performance of Video Games Live on July 31st. 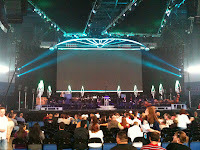 Video Games Live is a symphonic orchestra that plays themes and suites from different video games along with a laser light show and video of each game. These kinds of events help people appreciate new kinds of music that they would not normally experience through avenues that make it meaningful to them. I’m excited about what we could possibly see in the future. You can see more of my pictures on my Twitter and Facebook.